A rare bird among rare birds. 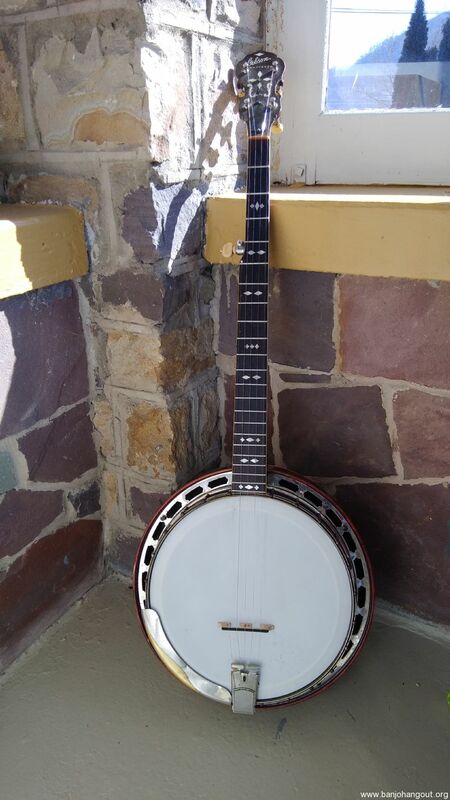 A true, honest to God, all original (except for head and bridge) pre-war Gibson five string Mastertone banjo. Serial number is 8127-16 which makes it one of the first four batches made. This is a rare opportunity to own one of the first of the most copied styles of banjos of all time. Don’t buy any of that stuff about a Ball Bearings volume or two piece flange being inferior. I’ve owned plenty of banjos and I know what I know—your ears won’t lie. Yes, there are louder banjos. If paint peeling volume is your thing I’d go for a prewar fat-boy rim, OPF, and quality no hole tone ring. If TONE is your thing you’ll never find more of it than you will in this banjo. This banjo has many voices, it can be set up to sound like an archtop but actually I’ve always thought that Ball Bearings had more of a flathead sound down the neck (just my opinion.) 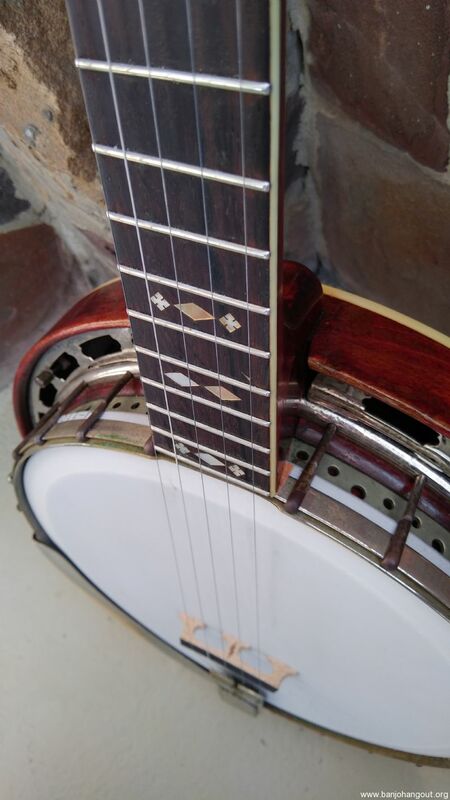 As with all Ball Bearings there is a natural springiness and reverb built into the tone due to the construction of the tone ring that no other banjo can accomplish—it just sounds OLD. It is one of those rare banjos that can handle any style. I’ve used it for two and three fingered (with and without picks) as well as frailing/clawhammer and I have been quite pleased. I imagine you could also use it for classical music or play it with a pick as well and be satisfied. As to its providence this one was owned most recently by Jason Bales who played it at Dollywood every day as his main banjo. 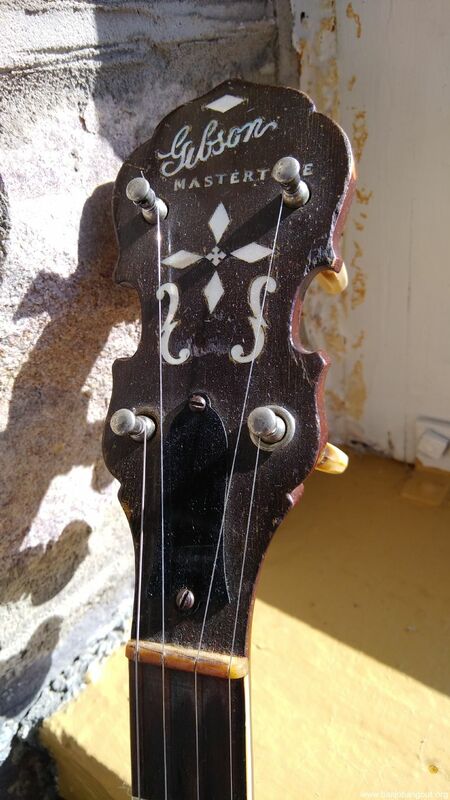 In his quest to raise funds to obtain a pre-war flathead this banjo wound up in my hands. It has also passed through Curtis McPeak’s shop many years ago as part of an estate. There is a name scratched inside the resonator (see pic.) It is doubtful that this was the original owner however it is not out of the question. This banjo is old and it has BEEN PLAYED therefore the condition reflects this reality. I’d list it as “Good.” Most importantly the original five string neck has never been repaired or modified in any way. Everything is there—nothing has been replaced (except head and bridge), nothing re-plated. 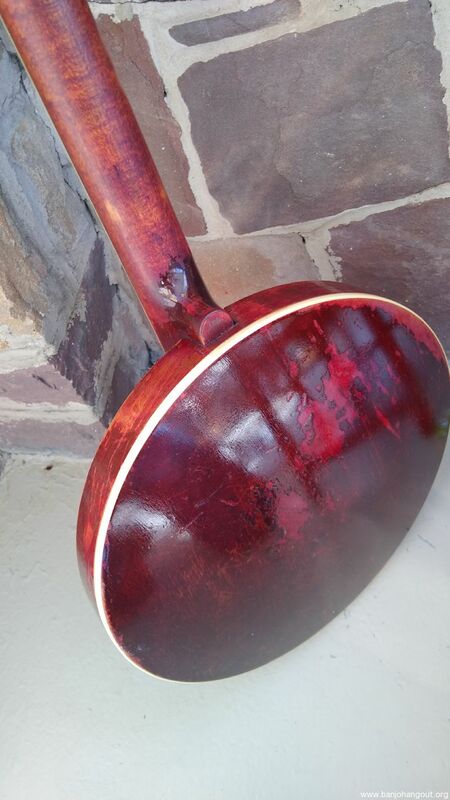 The back of the resonator only has been sprayed (the stain was bleeding on Jason’s shirt so Ronnie Bales put a clear coat over top of it.) 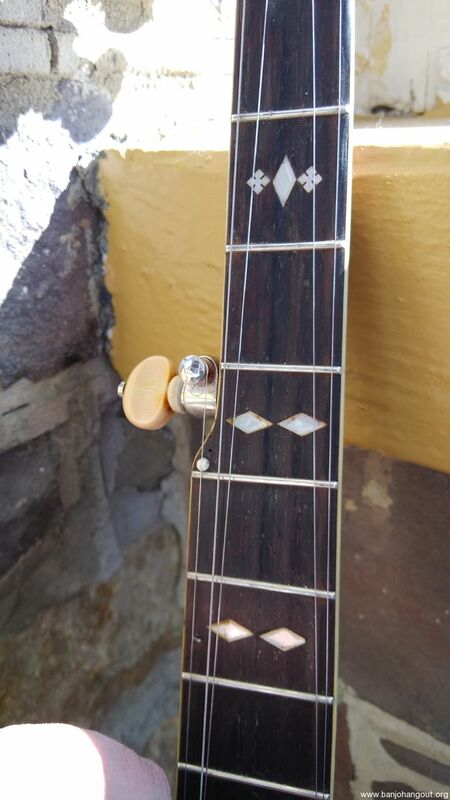 There has also been a shim (which is removable) added to the neck as most all pre-war five string banjos had their heel cut to accommodate a 1/2 inch. bridge. This one currently sports a 5/8 bridge with very low action at the 12th fret. The action is fantastic and the neck is straight with no other repairs done anywhere. The neck is a dream to play and the sound is to die for. But Ball Bearings Lack Volume, Right? Just listen to the clip of “Turkey in the Straw” and let me know if you still feel the same way. I just bought a house and I can live with less banjo if it means paying down my mortgage. I would consider a partial trade for a Nechville Nuvo or a Deering John Hartford with removable resonator. Serious buyers email me for pics.